Do sociology graduate students need to publish more today than they did a generation ago to get a faculty position? Do assistant professors need to publish more to get tenure? On a basic human level, aspiring sociologists may be working harder, more quickly, and under greater pressure than ever before to achieve the same rewards—all with fewer additional resources. Talented scholars may consequently be driven from the profession, as they find success costlier and less easily attainable. Rising publication expectations may aggravate inequalities within and between sociology departments. Well-resourced departments are often better equipped to give their graduate students and junior faculty the resources they need to meet heightened publishing expectations. At the same time, within departments, growing publishing expectations may exacerbate inequalities between (a) scholars who work in article-oriented subfields and who typically perform quantitative analyses of existing secondary data and (b) scholars who work in book-oriented subfields and/or who typically collect and perform qualitative analyses of original primary data. The former group may be better able to publish more and more quickly. Rising publishing expectations may incentivize junior scholars to work in subfields, to design projects, and/or to utilize methodologies that put them in a better position to meet higher expectations for publishing. The quality of scholarship may also decline as expectations for productivity and speed increase. Ideas and projects take time to develop and mature, and the need to publish more and more quickly may erode the quality of research. In a recent article, I documented trends between 1991 and 2017 in how much new assistant professors had published at the time they started their first jobs. I also documented trends across those years in how much newly promoted associate professors had published at the time they were promoted. My results pertain to 342 new assistant professors and 272 newly promoted associate professors in 21 of the top PhD-granting American sociology departments. Details of the methodology can be found in my paper and the data and code used to produce my results are available at www.rob-warren.com/pub_trends.html. Please email me if you find errors. In Figure 1a, I present trends over time in how much the 342 new assistant professors had published at the time they began their first jobs. New assistant professors in the most recent years publish roughly twice as much as their counterparts did in the 1990s. Much of this growth is due to rising numbers of peer reviewed articles, although there has also been growth in the numbers of book chapters and other publications. Whereas, the most recent cohort of new assistant professors averaged 4.8 peer-reviewed articles, their counterparts in the early 1990s averaged only 2.5 articles. Likewise, in Figure 1b, I present trends over time in how much the 264 newly promoted associate professors had published at the time of their promotions. Here, increases over time in publishing have been more gradual—at least until the 2010s. However, publication patterns look different for newly promoted associate professors who had published zero books by the year they were promoted (“article people”) and those who published at least one book (“book people”). Among article people, trends look more like those for new assistant professors: In the 2010s, they publish almost twice as many peer-reviewed articles as their counterparts in the 1990s. Among book people, the rise in publishing expectations has been much more gradual. However, even among book people the number of peer reviewed articles has risen; book people in the 2010s now publish as many articles as article people were publishing in the 1990s. For new assistant professors, the doubling of publication expectations appears to be driven by (a) the supply of new PhDs and the demand for new faculty and perhaps (b) technological advances that aid productivity. As shown in Figure 2, the number of new sociology PhDs awarded has increased by 50% since 1991, but the number of new assistant professor positions—at least in the top departments—has been basically flat (except for recession-era dips). Hiring committees have thus been able to be more selective and to hold out for applicants with higher numbers of publications before they start their first faculty jobs. Among newly promoted associate professors, these same conclusions both hold: (a) Supply and demand and perhaps (b) technological advances that aid productivity, each appear to have driven the increase in publication expectations. However, newly promoted associate professors’ publication counts have also increased over time because (c) the number of co-authors on their publications has grown over time. This inflates per-person publication counts without necessarily increasing the total quantity of published work. I surmise that two basic market forces are at work and that these forces largely drive the trends seen in Figure 1. 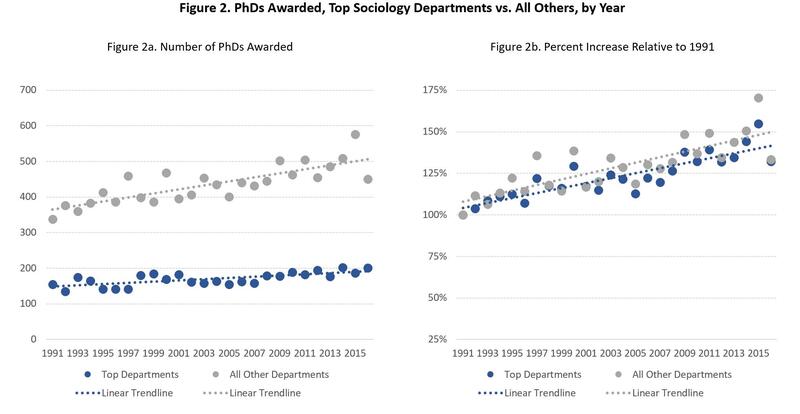 First, sociology departments are producing more PhDs, but (at least the top) departments are not hiring more new assistant professors or promoting more assistant professors to the associate level. There are a host of largely economic and fiscal reasons for these trends, having to do with the organization and financing of higher education. Second, over time sociologists have come to work more and more in interdisciplinary subfields and the growth in the number of published articles over time is partly driven by increased publishing in journals outside of sociology — demography, public health, and public policy. The move toward working and publishing more in these interdisciplinary fields, which often involve larger grant-funded collaborative teams, has also increased the number of co-authors on newly promoted associate professors’ articles. Of course, these two forces are likely related: As fiscal pressures on (especially public) universities and departments have increased, they may have found it easier and more financially beneficial to invest in hiring in areas in which it is possible to attract grant funds to support larger, collaborative, interdisciplinary projects. The financial pressures that (especially public) universities have faced in recent decades has led the supply of new sociology PhDs to outstrip demand and has also incentivized universities, departments, and individual sociologists to invest more heavily in interdisciplinary subfields that attract external grant money to campuses—and that also lead to multi-authored publications in inter-disciplinary or other-disciplinary journals. This post is based on the author’s article, How much do you have to publish to get a job in a top sociology department? Or to get tenure? Trends over a generation, published in Sociological Science. John Robert Warren is the Director of the Minnesota Population Center and Professor of Sociology at the University of Minnesota. Learn more about him and his research at www.rob-warren.com. His ORCID iD is 0000-0001-6079-5122.